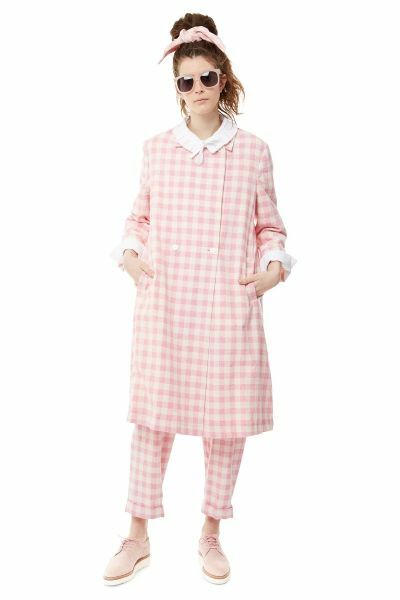 The Mary coat has been made in pink & ecru gingham made of recycled fabric. A double breasted coat with a narrow neat collar. It has a boxy shape that sits nicely just below the knee. The coat fastens with 4 Cabbages & Roses engraved buttons widely spaced apart. Full length sleeves can be rolled up for warmer days. The coat has welt pockets, a dart falls down into the pocket giving Mary her marvellous shape. With slightly slouchy shoulders giving her a relaxed fit, Mary is the perfect grab and go coat. She if fully lined in a lovely crisp cotton. Caring for your Coat. We recommend that you dry clean this coat with an ecologically friendly dry cleaner. Please do not wash. The coat can be pressed with a cool iron, please do not bleach or tumble dry Mary.